My photographs explore synthetic elements that signify a human presence on the land. The starting point for my research is the assertion that the landscape art developed from the 17th Century is a construct that quickly became established as the dominant method of experiencing nature. When this aesthetic is combined with the apparent realism of photography it both informs and reveals our attitudes to the environment. Mainstream landscape photography that often relies on the picturesque offers a dangerous vision of a timeless environment unaffected by people. 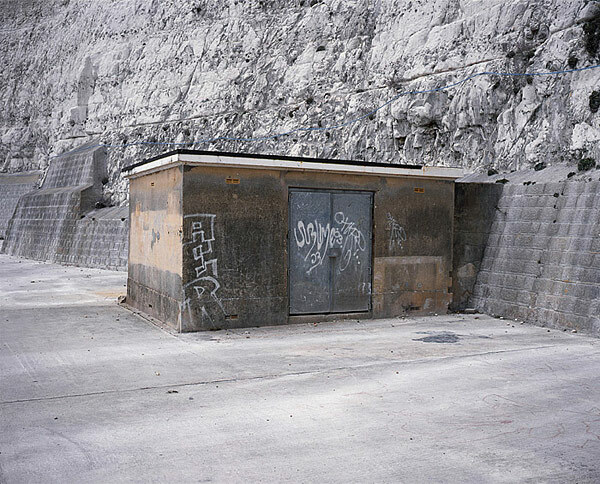 The featured picture is from the series Mega Structure — a collection of curious utilitarian buildings found in often quite picturesque locations around England. The purpose of these buildings is not always immediately apparent. Small in scale, and with little or no architectural merit, they simply seem to exist, and go largely unnoticed. Despite this they are very much a part of the landscape that we experience rather than some picturesque idyll.